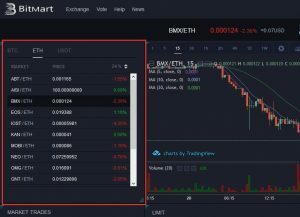 Home Cryptocurrency Why the BitMart Exchange is the Future of Cryptocurrency Trading! 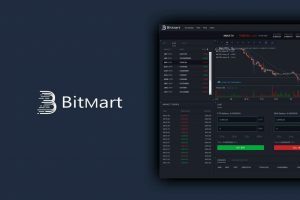 Why the BitMart Exchange is the Future of Cryptocurrency Trading! Over the last decade, fiat currencies have actively been traded as assets. This activity normally occurs on a dedicated market that is known as FOREX. As a matter of fact, $5.3 trillion USD is traded every day in this market. Since the development and mass acceptance of digital currencies, there are markets for trading them too. One of the most innovative ones is BitMart. BitMart was created to facilitate simplified, regular trading of digital currencies. It also allows you to execute various types of trading strategies with your portfolio. Examples of these are spot trading, Over The Counter (OTC) and contract trading as well. BitMart was created by developers who have a firm understanding of the cryptocurrency market. They administer it on a regular basis to ensure expansion, lightning-fast services and comprehensive security. This market is run and maintained by the BitMart Foundation. This company is registered in the Cayman Islands and has offices in many cities around the globe. The exchange is run by an international team of technicians. They came together in November 2017 and have been working ever since to maintain the technology, operations and marketing departments of the exchange. The exchange registered its first tokens in January 2018. The following month, its developer team went on a global roadshow promoting the exchange. In March of the same year, the BitMart Foundation launched spot trading in the exchange and registered with United States regulations in April. They went on to provide a one stop location for cryptocurrency trading today. Modern traders understand that the cryptocurrency market has immense profit potential. Therefore, BitMart provides a platform where they can execute various types of trading methods to maximize profit. Some examples of these methods include Over The Counter (OTC), shorting tokens, spot trading, value investing and day trading among others. BitMart provides some superior programmable resources which traders can use to execute these strategies. Moreover, they have access to various types of digital assets. In this way, it is a one-stop location for cryptocurrency investment. Trading assets on exchanges has evolved immensely. BitMart has grown along with this practice and facilitates both Client to Client (C2C) and Business to Business (B2B) trading. By providing these media, the platform allows for extended, comprehensive trading. As a result, it is an extended market for cryptocurrency investment. The infrastructure of BitMart promotes stable market activity. Under this condition, BitMart allows investors to trade in future contracts. With this instrument, they can optimistically bet on the future value of assets. Best of all, traders can interact with all the asset types on BitMart in this unique way. BitMart combines many trading platforms from all over the world together. You can find all the instruments from all markets in one convenient place. By doing this, BitMart allows traders and investors to perform borderless transactions. Furthermore, they can execute comprehensive trades across multiple markets through BitMart. This means that traders can receive profits directly from many markets all at the same time. By using the law of compounding profit, correctly executed BitMart trades can deliver huge margins for the smart trader! This exchange has applications for Windows, Mac, iOS and Android operating systems. Hence, you can access BitMart easily from anywhere in the world. It is flexible and promotes rapid, convenient trading. 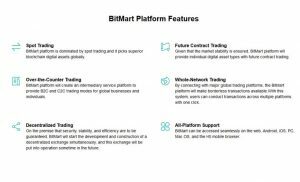 The process of signing up to trade in BitMart is very easy and quite simple. All that you need to do is submit your email address. Having done so, visit your email and there you will see an activation code. Click on it to activate the trading account. If you have an invitation code, proceed to enter it as you activate. This will direct you to the main trading section in the platform. There, you can begin trading cryptocurrencies. An excellent feature of BitMart is that it is available in many languages. Hence, traders from various parts of the world can engage in it. An excellent facility of BitMart is that it is fully compatible with a wide range of cryptocurrencies. Here, you can trade in digital currencies such as Bitcoin, Ethereum, Litecoin, Monero and many others quite easily. You can execute strategic trades within this exchange. As such, you can boost your profits in a short period of time. One of the latest ways to make money on the Internet is to trade in cryptocurrencies. BitMart is a perfect platform for this type of trade. Registration is free. In addition to that, you can trade while enjoying low transaction fees. BitMart is a one-stop spot for trading digital currencies online! Previous articleThe best Smartwatches money can buy! Next articleTrade Cryptocurrencies With Minimum Risk By Buying Bit20!